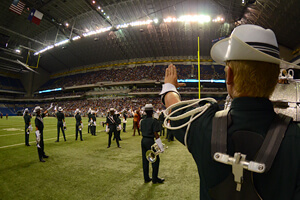 Drum Corps International will present the 41st edition of its annual summer tour, June 19 to Aug. 10, 2013. Showcasing the world's most elite marching music ensembles, the 2013 Drum Corps International Tour will span a total of 53 days and feature more than 100 competitive events in 38 states. More than 45 World, Open and All-Age Class corps are expected to perform in stadiums across the United States this summer, culminating during the first full week of August with the DCI World Championships in Michigan City and Indianapolis, Ind. 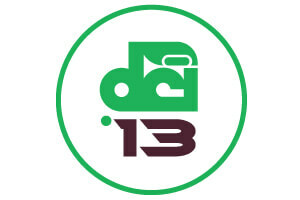 The 2013 DCI Tour will officially get underway on Wednesday, June 19 in Mesa, Ariz., before the majority of corps see their first competitive action Friday, June 21 and Saturday, June 22 at events in the Midwest and on the West Coast. in one of the first events of 2013 on Saturday, June 22. Highlighting this year's Pacific portion of the tour will be Carolina Crown, as the Fort Mill, S.C. corps makes its first early-season June appearance in California. Early on, look for Crown to be staring down the Blue Devils after the two corps ran neck-and-neck throughout 2012 with silver and gold medal finishes respectively. The two corps will face each other three straight days in just the first week of the season. "It'll be exciting to go head-to-head with corps like the Blue Devils and Santa Clara Vanguard this early in the season," Carolina Crown Executive Director Jim Coates said. Coming out of their Pacific Tour, Carolina Crown along with Santa Clara Vanguard, Blue Devils, Cadets, Cavaliers, Phantom Regiment and Bluecoats will together host a string of shows across the country. Beginning on July 11 in Warrensburg, Mo., this event series will also make stops in DeKalb, Ill., Round Rock, Texas, Murfreesboro, Tenn., Charlotte, N.C., East Rutherford, N.J. and Buffalo N.Y. through July and August. Dome will take place on a Sunday in 2013, July 28. Drum Corps International's Premier Events are a collection of some of the most prestigious stops on the annual DCI Tour. Generally produced in larger, collegiate and professional sports stadium facilities on key weekends throughout the summer months, these events draw some of the biggest crowds of the season. Among the highlights of early-season events will be a brand new show in Lexington, Ky., on Friday, June 21. Shows in Stanford, Calif. (June 22) and Muncie, Ind. (June 28) will finish out Premier Events scheduled in June. 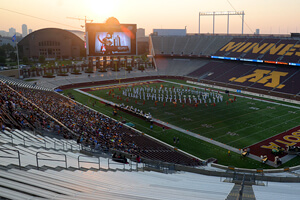 A return to Minneapolis on Saturday, July 13, will feature the largest lineup of corps on the DCI Tour to date, including 18 of 23 World Class corps. 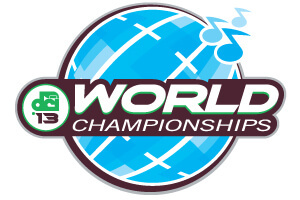 Saturday, July 20 at the Alamodome in San Antonio will be the very first time in 2013 that fans get to see the entire lineup of World Class corps compared on a single results sheet. 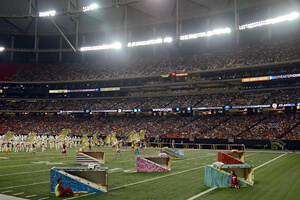 The only other event outside of the World Championships to feature every World Class corps in one night of competition, the DCI Atlanta Southeastern Championship, will take place on a different day of the week in 2013, coming to the Georgia Dome on Sunday, July 28. 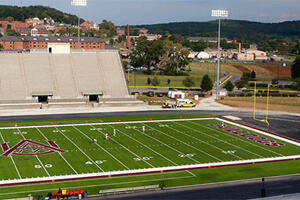 Louis Crews Stadium will be a new venue for corps in 2013. "Running up against a citywide event that will be using all of the convention facilities including the Georgia Dome through our usual Saturday date, we had to push this year's event back a day," DCI Director of Events Susan Kuehnhold said. "Moving the Southeastern Championship to Sunday, however, opened up the opportunity for us stage a brand new and exciting event the day before." 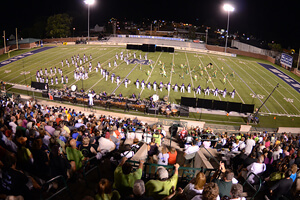 That first-time event, DCI North Alabama, will take place on the campus of Alabama A&M University in Huntsville on Saturday, July 27. 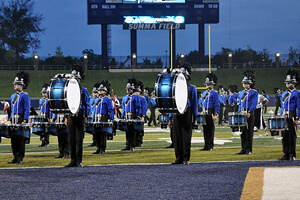 A 14-corps lineup is scheduled to perform at the 21,000-seat Louis Crews Stadium. The DCI Eastern Classic in Allentown, Pa., will once again finish out DCI's Premier Event series Aug. 2-3. This longstanding competition annually marks one of the last stops of all World Class corps before they turn their buses toward Indianapolis for the World Championships. "Connecting the dots" between the schedule of Premier Events will be the bulk of the 2013 DCI Tour schedule. 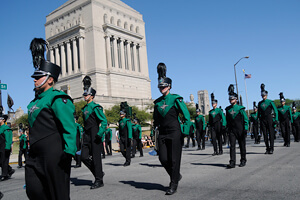 These sanctioned events in cities like Olathe, Kan., Cedarburg, Wis., and Fairfield, Ohio, serve as important performance opportunities and waypoints for the corps as they crisscross the country from one tour stop to the next. "The members of our Tour Event Network who produce, promote and manage those events help make the entire DCI Tour happen," says Kuehnhold. "We're very fortunate to have committed partners who help lay the groundwork for our corps to help them safely move from city to city across the country." at Lucas Oil Stadium Aug. 8-10, 2013. Following the same format established two years ago, Open Class corps will kick off the week of World Championship festivities in Northwest Indiana. Their Semifinals and Finals competition will take place Monday, Aug. 5 and Tuesday, Aug. 6 at Ames Field in Michigan City. Championship events in Indianapolis will get underway the afternoon of Wednesday, Aug. 7, as Open Class corps arrive from Michigan City and host their Individual & Ensemble Competition at the Indiana Convention Center. Later that evening, corps staff, fans and others are invited to the annual World Championship Hall of Fame Kickoff Party for one last opportunity to relax before competition gets underway Thursday morning. All World and Open Class corps will compete against each other as the World Championship Prelims get started on Thursday, Aug. 8 at Lucas Oil Stadium. The top 25 scoring groups no matter their class designation will advance to the Semifinals on Friday, Aug. 9, with the top 12 making their way to the biggest event of the entire summer season, the World Championship Finals on Saturday, Aug. 10.
non-finalist corps in downtown Indianapolis. Also on Saturday prior to the Finals competition will be the third annual Celebrate Indy Arts! Parade, which will bring together all non-finalist corps and local Indianapolis arts groups set against the backdrop of the stately Indiana War Memorial. 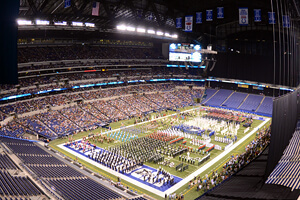 36,494 were in attendance over the three-day series of Championship events at Lucas Oil Stadium in 2012, the highest to date recorded by Drum Corps International. "2013 will mark the fifth anniversary of World Championship events at Lucas Oil Stadium," DCI Executive Director Dan Acheson said. "Thanks to the continued welcome from and support of all of our friends in Indianapolis, each year we return is even better than the last." Scheduled to go on sale starting Monday, Dec. 3 through the DCI Box Office and Ticketmaster, will be nearly 15 DCI Tour events including those taking place at the Atlanta Georgia Dome and the San Antonio Alamodome, along with single-night tickets to the 2013 World Championships. Sign up for Drum Corps International's "Box Office Alerts" to receive e-mail notification when tickets to events near you will be going on sale. of Minnesota on Saturday, July 13. Minneapolis, MN TCF Bank Stadium, University of Minnesota Saturday, July 13 Lebanon, IL (St. Louis) McKendree University Monday, July 15. Denton, TX CH Collins Athletic Complex Thursday, July 18. Houston, TX (Cypress) Berry Center Athletic Complex Friday, July 19. San Antonio, TX Alamodome Saturday, July 20.
will see all 23 of DCI's World Class corps. Dallas, TX Lake Highlands High School Tuesday, July 23. Hattiesburg, MS M. M. Roberts Stadium, University of Southern MS Wednesday, July 24 Little Rock, AR War Memorial Stadium, AT&T Field Wednesday, July 24. Murfreesboro, TN Floyd Stadium, Middle Tenn. State University Friday, July 26 Huntsville, AL Louis Crews Stadium, Alabama A&M University Saturday, July 27 Atlanta, GA Georgia Dome Sunday, July 28. Allentown, PA J. Birney Crum Stadium Friday, Aug. 2 & Saturday, Aug. 3.
take place Tuesday, Aug. 6 in Michigan City, Ind. World Championship Prelims Lucas Oil Stadium, Indianapolis, IN Thursday, August 8. World Championship Semifinals Lucas Oil Stadium, Indianapolis, IN Friday, August 9. Celebrate Indy Arts! Parade Indiana War Memorial, Indianapolis, IN Saturday, August 10 World Championship Finals Lucas Oil Stadium, Indianapolis, IN Saturday, August 10. Drum Corps International has reserved special blocks of rooms at many downtown Indianapolis hotel properties to put you only steps from all the excitement of the 2013 Championships. Visit DCI.org/IndyHotels to view available properties and book your reservation today. All 2013 DCI Tour dates, locations, events and lineups are subject to change.